When your out fishing on the flats and you catch a spotted seatrout it is a good idea to know the regulations and requirements in order to keep what you catch. UPDATE: From FWC posted on 02.20.2019: Currently, anglers may harvest a single spotted seatrout per day that is larger than 20 inches. 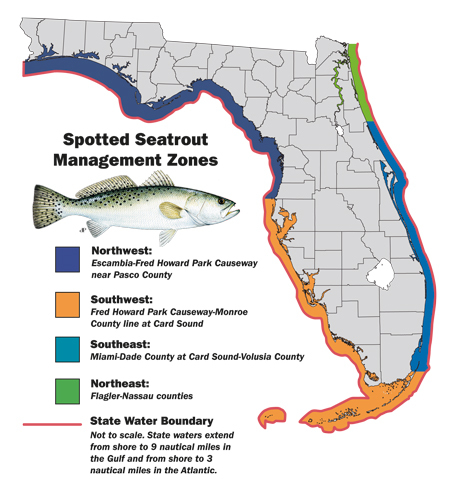 Starting Friday, Feb. 22, recreational anglers will no longer be allowed to harvest any spotted seatrout over 20 inches total length when fishing in state or federal waters from the Pasco-Hernando county line south to Gordon Pass in Collier County. This rule change will remain in effect through May 10, 2019. Red drum and snook are currently catch-and-release only in this region through May 10 as well.